Oral thrush is a fungal infection found in the mouth caused by the yeast Candida. Small numbers of the fungus are usually found on the skin and in the mouth. However, certain conditions can cause the Candida to multiply and result in oral thrush. Here at treated.com you can quickly and safely obtain antifungal medication to treat oral thrush. Complete our online health questionnaire, and once your answers have been reviewed by a doctor, your medication will be sent to you by 24 hour courier. Oral thrush is a non-contagious infection found in and around the mouth which can involve the tongue, inner cheek, lips and gums. It is most common in babies and young children, however, it can also affect older children and adults. An oral thrush infection can occur when an abundance of the yeast germ, known as Candida, is present in the mouth. Candida is commonly found on the skin and in the mouth of healthy individuals but usually only in small volumes. The body’s natural defences normally keep the production of yeast under control. However, in certain situations the Candida is allowed to multiply resulting in an upset in the body’s fungal equilibrium. Instances which can affect the body’s ability to regulate the production of Candida include prolonged or repeated use of oral antibiotics, inhaled medicines for asthma and COPD, smoking, dentures, contraceptive pill, poor oral hygiene and diabetes. Oral thrush is usually found in adults with a weakened immune system. It can affect male and females of any age and often produces white lesions in the mouth, normally on the tongue or inner cheeks but sometimes found on the roof of the mouth, gums, tonsils or the back of the throat. The lesions can be painful and may bleed. You may also experience a loss of taste or an unpleasant taste, redness inside the mouth or throat, cracks at the corner of the mouth and a painful burning sensation in the mouth and sometimes it may be difficult to eat and drink. Mild cases of oral thrush do not produce obvious symptoms and can be painless. Antifungal medication is used to treat mouth infections. The active ingredient, Nystatin, works by interfering with Ergosterol, an essential component of fungal cell membranes. The disruption causes holes to form in the cell membranes, allowing unwanted substances to enter and kill off the fungal cell. By killing off the fungal cell you reduce the symptoms and cure the infection. We understand that it can be inconvenient to see your GP for oral thrush treatment, but with our speedy online prescription service, you can purchase the medication you require without the need for an appointment. Simply complete our health assessment, and a GMC-registered doctor will review your answers. Once your order is approved, our UK-based pharmacy will dispense your treatment and ship it to you inside one business day. A fungal mouth infection can be easily treated with a course of antifungal medication. Nystatin is part of the antifungal antibiotics group and works by killing the organisms that have brought on the infection. Fungal mouth infections are caused by an unusually high presence of the yeast fungus. Antifungal antibiotics work by killing off the bacteria that is causing the infection. Not everyone who takes antifungal medication will experience side effects. It is still important to be aware of the possible reactions in case you need to seek medical attention. Several of the most common side effects include mouth irritation, nausea or vomiting, diarrhoea and itching. This list is not comprehensive and attention should be paid to the medication page or patient information leaflet. There are no known interactions between Nystatin and other medications. However, should you experience any unusual symptoms whilst taking this medication you should inform you doctor. Nystatin is an effective method of topically treating mouth infections. It immediately starts treatment at the point of application and should not interfere with other medications as it is not absorbed into the bloodstream. Nystatin is not suitable for everyone. It is important that you provide a full and detailed background of your past medical history. Click on the product page to find out more information. Yes. It is uncommon to develop side effects with antifungal medication but it is still important to be aware of the potential reactions so that you can seek medical attention if required. You may experience nausea or vomiting, mouth irritation, diarrhea or a rash. Our online consultation service will help to determine whether Nystatin is a suitable treatment for your oral thrush. 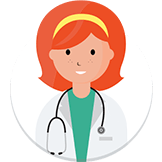 Complete our simple assessment and once your case has been reviewed by one of our GMC-registered doctors, your medication will be shipped directly to you in one working day.